From funk-laced guitars, to swooshing disco drums, to jazz-fusion keys and bombastic rock vocals, phase shifting is a wildly diverse effect that’s at the heart of countless records from the 60s to today. PhaseMistress captures the sounds of legendary phasers and packs them into one plug-in that takes this creative effect to the next level. At Soundtoys, we have a bit of a phaser hoarding problem. We have them stacked in our test room, stock room and literally lining the halls. When designing PhaseMistress, we carefully studied some of the best like the Bi-Phase, Boss Super Phaser, Phase 90, Moogerfooger 12 stage, Small Stone, Trine and many more. We needed to be sure PhaseMistress nailed that rich, silky analog sound. Then we went farther, and added deep tweakability and a range of inspiring rhythmic tools. We think you’re going to love what we came up with. While PhaseMistress comes packed with useful presets and an easy to use hardware-inspired interface, we also give you deep control over the phasing “circuit” that gives this effect its distinctive sound. You can choose from 69 different style presets that alter the phaser’s internal structure. Set the number of stages from subtle 2-stage phasing up to a wild 24 stages. You can also fine-tune the resonance, color and intensity of the effect to craft your own unique phase shifting styles. Many phasers create their whooshing sound with the help of a humble low frequency oscillator (LFO). That’s great when you want a simple back and forth sweep. But what if you want something a bit more out there? 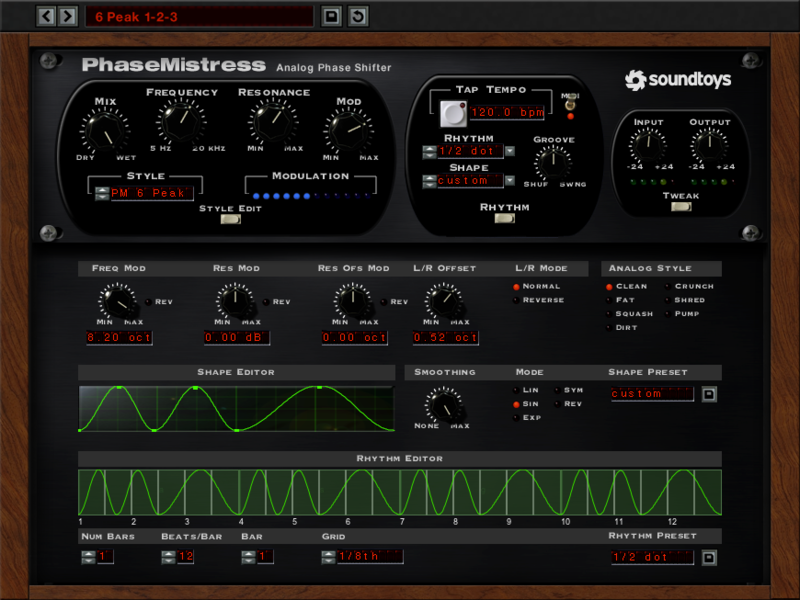 In PhaseMistress you can choose from a multitude of creative LFO shapes that go beyond what you’ll find in hardware–and you can even draw your own curves in the Tweak panel. For cool robotic effects, try the random mode and step mode for phase shifts that jump rather than sweep. Rhythm mode lets you program your own rhythmic patterns, or choose from some great pre-made ones, too. And in Envelope mode, PhaseMistress responds to the dynamics of the incoming audio making it an awesome rhythm-triggered effect for funky drums, slap bass or rhythm guitar sounds. Soundtoys, PhaseMistress and their respective logos are all trademarks of Soundtoys, Inc.
*All other trademarks are the property of their respective owners, which are in no way associated or affiliated with Soundtoys. These trademarks are used only for historical reference or to identify products whose sounds or tone were studied in the development of PhaseMistress.